Scandinavia by Train – Is Eurail Scandinavia Pass the best option? Travel in Scandinavia is an incredible experience. The big cities, the countryside and the Northern Lights attract thousands of tourists every year. There are many ways to travel around Scandinavia and in my opinion travel by train is one of the best ways to explore the nordic countries. We did a 15 days trip in Scandinavia by train, using our Eurail Scandinavia Pass and the trip went way better than we expected. Now it’s time to put together all the costs and check if it was worth to travel in Scandinavia with Eurail Pass. Or if it would be better to get around with single train tickets or even flying. 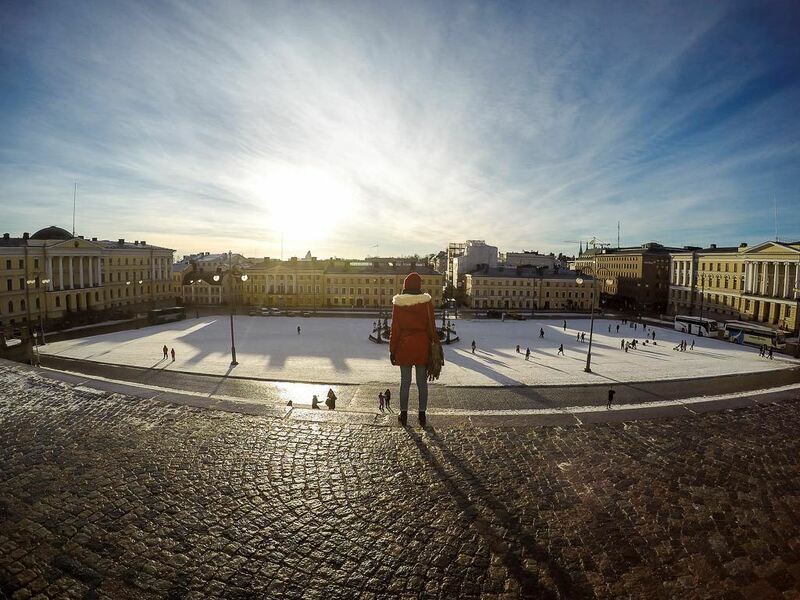 Geographically Norway, Denmark, and Sweden are considered Scandinavian countries, but when it comes to travel planning we can add Finland to the group. Especially because when you decide to travel in Scandinavia by rail, most of the tickets and train passes include the four countries. This was our second time traveling with a Eurail Pass. We did a one month trip using the monthly Global Pass and we wrote a comprehensive guide explaining why traveling with Eurail is a good option even if sometimes it’s not the cheapest one. The blog post Traveling with Eurail Pass – 7 Reasons why you should do it or not has all the information about the different types of Eurail Passes and how to avoid reservation fees. Now let’s talk about a different experience, a train trip in Scandinavia using the Eurail Pass for all kinds of trains. Before we jump to the costs and how to travel in Scandinavia with Eurail Pass, I just make clear that the Eurail Pass is for non- European citizens. 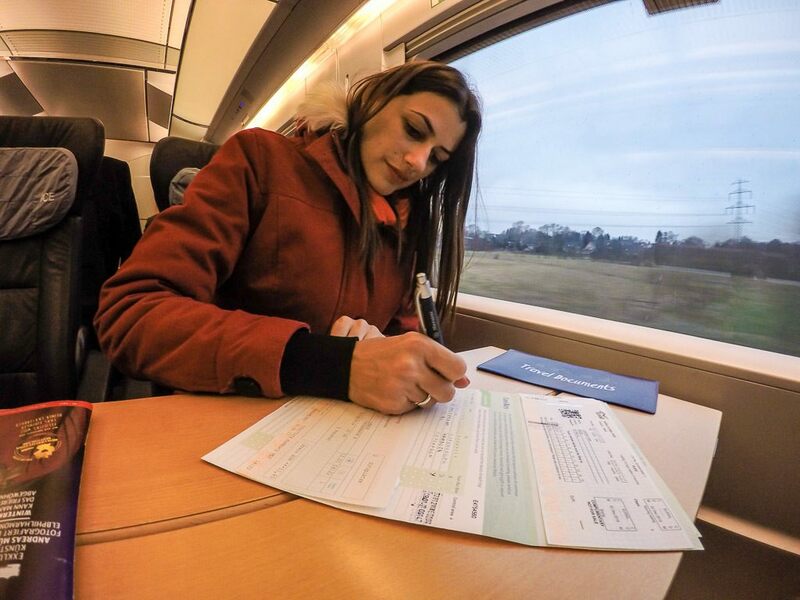 If you are a European citizen you can travel on an Interrail Pass, an even cheaper and more flexible train pass. What is the Scandinavia Eurail Pass? Eurail has different types of Pass, they can be organized by days of travels, countries you want to visit or the Global Pass that covers almost the whole Europe. As from January 2016, the Eurail Scandinavia Pass started to be sold as a one-country pass. So you don’t need to buy a 4 Countries Pass to travel around Scandinavia… Of course, you can still buy the Global Pass if you want to travel beyond Scandinavia, but if your itinerary is only between Norway, Sweden, Denmark and Finland, the Eurail Scandinavia Pass is the easiest and cheapest Eurail Pass you can choose from. The pass is valid for a month, and you can purchase it according to the number of days you plan to travel. You can choose from 3 days up to 8 days of travels within a month. We visited 4 cities during our Scandinavia trip, in this case, the 4 days within a month would be the best option. The Scandinavian Eurail Pass gives you benefits like discounts on ferry lines between Norway – Denmark, and Sweden – Finland. Also, the bus ride at the northern border between Sweden and Finland is covered by Eurail. Once a while Eurail adds new benefits to the pass, so keep an eye at the official website. As we talked on the other blog post, in many European countries is possible to travel with the Eurail Pass without doing any reservation, or paying reservation fees. But when it comes to a Scandinavia rail trip, the rules are a bit different. Although the four countries are covered by the same pass, there are different rules between them. We’ll talk about the reservations later on, but one thing you must know before buying the Eurail Scandinavia Pass is: you will need to make and pay for the reservation in some journeys. We did a 15 days trip in Scandinavia using the Eurail Pass, only one leg of the journey was done by bus because there wasn’t a train route there. If you have to fly to Scandinavia to start your trip, I would recommend searching for flights at Skyscanner or Kiwi.com. Norwegian Airlines has cheap flights to Oslo, Stockholm, and Helsinki. Any of this capitals is a good start point for your train trip in Scandinavia. We took an early morning train, a journey of almost 9 hours and we had to change trains on the way. Then from Denmark we did a small detour to Scotland. We flew from Copenhagen to Edinburgh to attend the Hogmanay Festival, the best New Year’s Celebration in Europe. Back from Scotland, we re-started our Scandinavia train trip, and after 2 days in Copenhagen, we traveled to Sweden. We took an afternoon train from Copenhagen to Stockholm, it was a 5 hours ride. 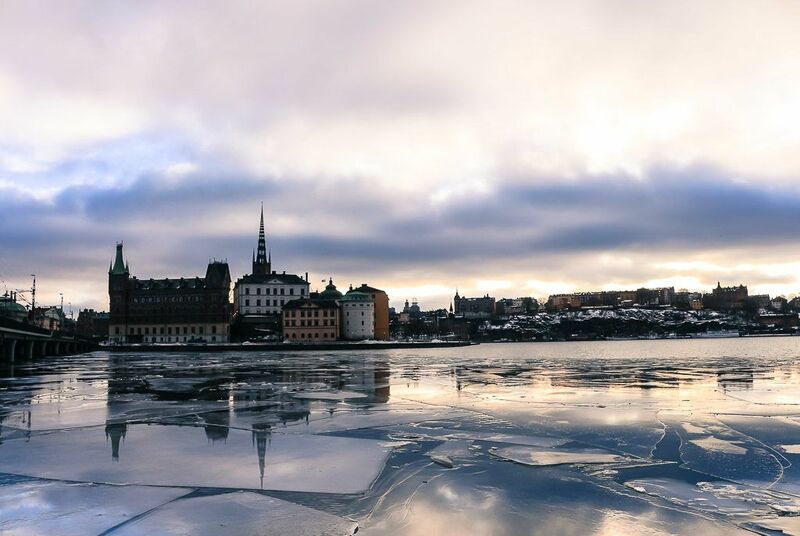 You can check our guide about what to do in Stockholm in winter. Here is where our journey to Lapland started. We went all the way to Rovaniemi in Finland to see the Northern Lights. We took a night train from Stockholm to Luleå [13 hours on a sleep train], then a bus from Lulea to Haparanda – Tornio [2:30 hours trip]. From Haparanda – Tornio it was another bus to Rovaniemi [almost 2 hours]. The bus from Luleå to Haparanda – Tornio was covered by the Eurail Scandinavia Pass, we didn’t need to pay or book anything. Only the leg between Haparanda – Tornio to Rovaniemi that we had to buy the bus ticket. 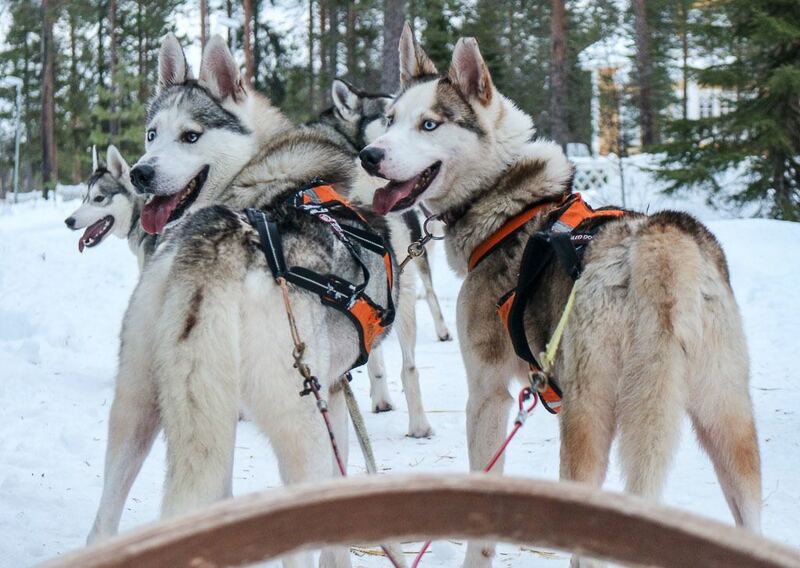 Check here all the details about this Lapland trip and what to do in Rovaniemi, Finland. > Train from Rovaniemi to Helsinki, Finland. This train journey is also known as the Santa Claus route. It’s a long and scenic route. To save time we took the night train from Rovaniemi to Helsinki, a direct train with sleep cabins, where we had our own bathroom and shower. The trip last 10 hours, and although we needed to book the cabin and pay a reservation fee, it was a money saving option as we saved on one night of accommodation. On our Scandinavia itinerary we choose to visit the capitals of the four countries and the Finnish Lapland. You can use the Scandinavia Eurail Pass to do a completely different route. If you fancy you can visit the Fjords in Norway, add Bergen, Malmo and Gothenburg to your itinerary. The flexibility of the pass is one of its best assets. 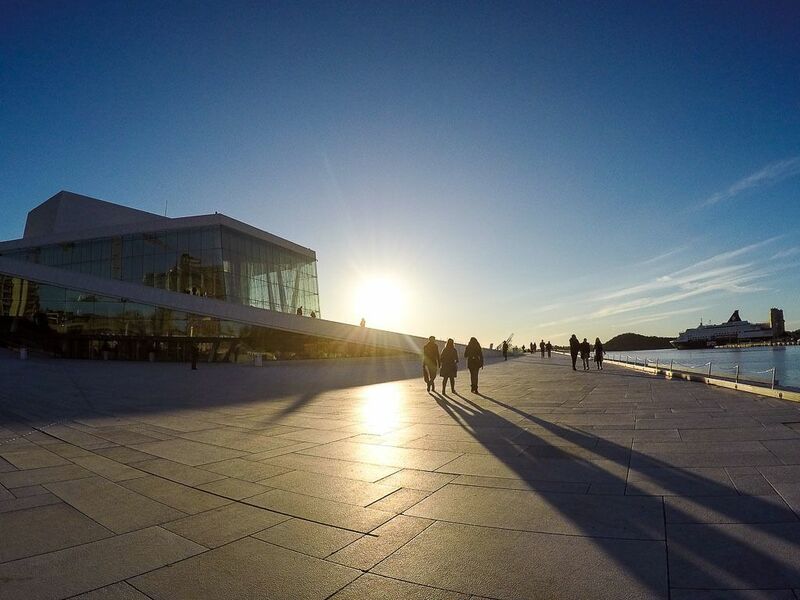 To help planning your itinerary in Scandinavia you must use the Eurail Planner App. It’s the best tool to plan your train trip in the whole Europe. Once you have the app on your phone you can check the timetables, the connections and even if the train needs reservation or not. The app works offline, easy and reliable. Don’t forget to check the number of destinations you want to visit in Scandinavia before buying the Eurail Pass. You don’t need to decide the days you are going to travel, only the amount of days of travel, so you can choose the best Eurail pass for you: 3, 4, 5 or 8 days within a month. The prices of the Eurail Scandinavia Pass vary according with the days of travels, and if you choose Youth [12 to 27 years old], Adult [over 28 years old], Family [1 adult + 1 kid from 4 to 11yo], and 1st or 2nd class. When we traveled around Scandinavia the Eurail Pass for the four countries was $343 per person [Adult 1st class]. We had to take the reservation rules very seriously in Scandinavia, the fine for traveling without a proper ticket or reservation is very expensive. Here is the list of Eurail reservations we made, how much we paid and the rules. The NSB [train company in Norway] and Eurail highly recommend making reservations for the regional trains. The reservation for night trains and the international speed trains [between Norway, Sweden, and Denmark] are compulsory. The good news is that if you have an Eurail Pass 1st class and if you are in Norway making your reservation via telephone or at the station you don’t need to pay any extra fee. We paid a 3 Euros reservation fee for our train that crossed Norway, Sweden, and Denmark. 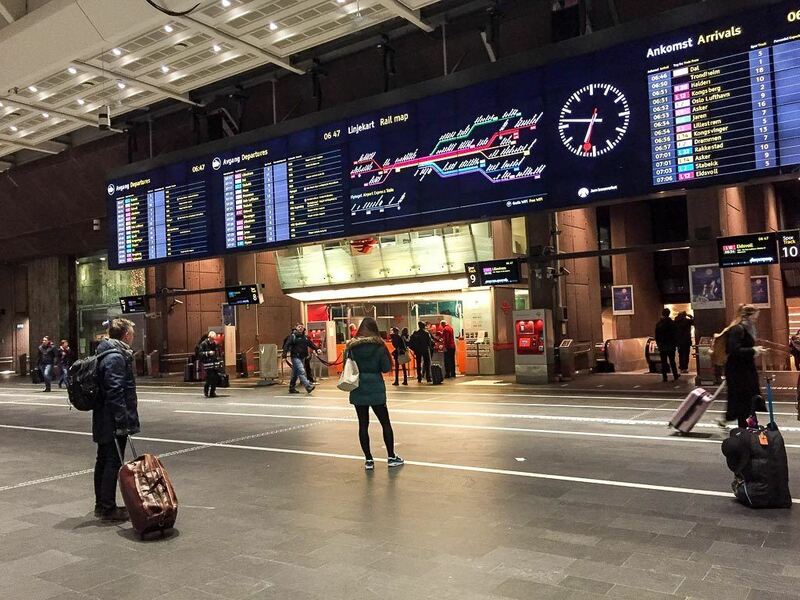 We did our reservation at the Oslo Central Station, super easy and fast. There is no need to book your seats with more than 2 or 3 days in advance, unless you are traveling in high season. The Scandinavia Pass or the Eurail Global Pass are valid for all domestic trains in Denmark. Seat reservation is required only for international trains to Sweden [SJ High-Speed train] or ICE international trains to other European Countries. For night trains the Eurail reservation is compulsory and the price changes according to the seat & class. We did our reservation one day before the trip directly at the Copenhagen Central Station. A heads up, there is a passport check before getting on the train to Sweden, so arrive at the train station at least 20 minutes in advance. As we had only 15 days in Scandinavia we decided to take night trains as much as possible to save time. We knew we would have to spend more on night train reservation fees, but on the other hand we wouldn’t pay for a hotel on those nights. The Train from Stockholm to Luleå was the case. We took the train at Stockholm Central Station around 6PM and we arrived in Luleå early morning, just in time to catch the bus and keep traveling to Lapland in Finland. In Sweden, for domestic trains [InterCity and regional] you don’t need to make reservations in advance. For all high-speed trains [domestic or international] you must make the reservation. The price of a reservation of domestic high speed trains can vary from 7 to 17 euros per person. International trains require a reservation fee that also ranges from 7 to 17 euros per person. The second leg of the trip from Stockholm to Rovaniemi was by bus. The ticket from Luleå to Haparanda-Tornio was covered by the Eurail Pass. The bus from Haparanda-Tornio to Rovaniemi can cost from 8 to 25 Euros, depending on the company and the time you choose. More details about the trip from Stockholm to Rovaniemi here. We did our Eurail reservation at the Stockholm Central Station two days before our trip and we bought the bus ticket from Haparanda-Tornio to Rovaniemi online, with two days in advance too. This was the most expensive Eurail reservation fee we paid in our Scandinavia rail trip, but the price came with a lot of perks. We booked a private double sleep cabin with our own bathroom and shower. We decided to invest a bit more on this trip as we were going to arrive in Helsinki early in the morning to catch a flight to Budapest at the end of the day. We had the cabin just for us, super comfy, clean and in a brand new train. The trip was smooth and we arrived in Helsinki fresh for a day of sightseeing followed by a flight at night time. It was the first time we had a shower during a train ride. Super cool! The rules for traveling with Eurail pass in Finland are: regional trains are free of reservation. But if you decided to take the high speed Pendolino [day or night trains] you must make a reservation, the fee starts at 9 euros and goes up according to the distance of the trip. The InterCity trains need reservation too, and the price changes with the route and the seat type. In Finland you can make the reservations at the train stations or via phone. We were in Rovaniemi, where there is no VR ticket office, so we called to the company customer service [+35 89 23192902] and booked our night train by phone. The night train reservation fee was paid by credit card. It was easy, fast and we received the ticket via email. In all four countries, the reservation fees for high speed and sleep trains vary according to the type of seat/class. Being 2nd class and seats the cheapest options. The Eurail website explains all fees here: Eurail International Reservation Fees, the Domestic Train Reservation Fees, and the Night Train Reservation Fees. Is the Eurail Scandinavia Pass worth the money? Now the truth: is Eurail Pass for Scandinavia worth the money? Well, it’s hard to prove with numbers if the Eurail Pass for Scandinavian countries is cheaper or more expensive than traveling with single train tickets. I have checked the price of each single train ticket and the value can vary a lot. To get the best price for flights or trains in Scandinavia you will need to book everything with months in advance, but then you won’t be able to change and travel spontaneously. Or to change the tickets it might be pricey. Night train: 70 usd per seat, or 80 usd for a bed in a 6 people sleep couchette. Without the Eurail Pass you would need to pay for the bus from Luleå to Haparanda-Tornio that would add 10 usd per person. Night train: seat 2nd class 40 usd. A bed on a private 2-people sleep cabin with bathroom and shower cost 105 usd per person. So, if you do the math and get the average price for this Scandinavia rail itinerary for one person on a 1st class seat, the trip would cost: 417 usd. Of course, this cost could vary a lot, a last minute ticket will be way more expensive than a promotional sale. But it’s definitely close to the amount paid on an Eurail Scandinavia Pass plus the reservation fees [343 usd for the Eurail Pass + 96 reservation fees = 439 usd]. For this small difference, I believe it’s worth to buy the Eurail Pass for Scandinavia. You have the freedom to choose when you want to travel and can change your itinerary at the last minute. Also you don’t need to buy multiple tickets from different websites. When you buy an Eurail Pass you get everything sorted out in only one website, you pay only once and get the ticket delivery at your home address. Now you know that Scandinavia Eurail Pass is one of the best ways to travel in Northern Europe. That with one Eurail Pass you can visit the four countries within a month, or with the Global Pass you can travel around whole Europe. Check the dates you want to travel, think about the cities in Scandinavia you want to visit and book the best Eurail Pass for your trip. If you have any doubt about the reservation fees and how to make them, leave your question at the comments below. Or you can send a message to Eurail, their customer service is very responsive. If you are looking for accommodation in Scandinavia our suggestion is to book your hotel and hostels through Agoda or Hotels.com. 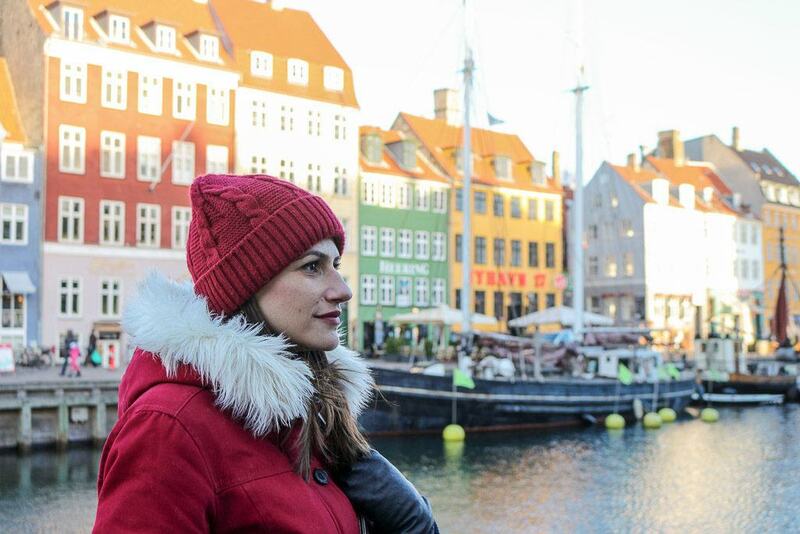 Airbnb is also a good option in Northern Europe, sign up here and get up to 30 USD of Airbnb credit to use on your Scandinavia adventure. 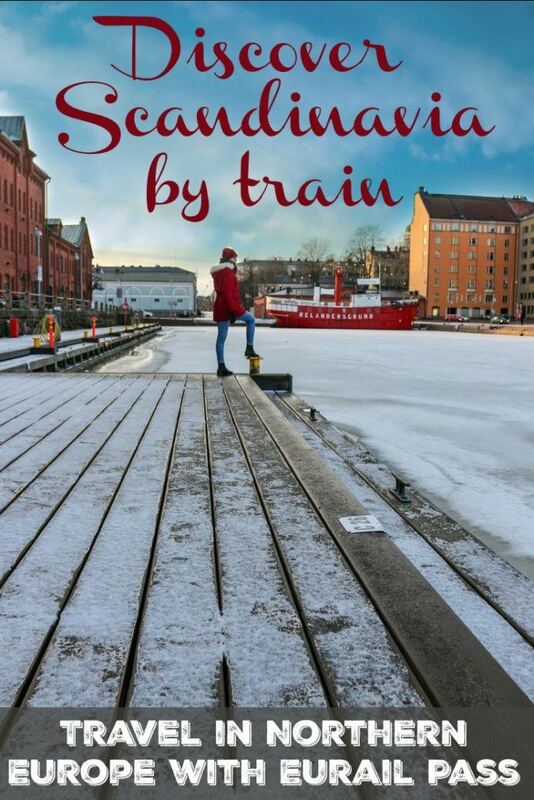 Happy travel and enjoy train trip with Eurail Scandinavia Pass. I love traveling by train around Europe, so getting a Eurorail ticket would be a great idea. Especially in Scandinavia, where traveling by train is so pricey. Looks at those huskies! Super round up here Natalie and Robson. Seems like many trains I have traveled on around the world require reservations; they fill up so quickly since in many cases, trains are a comfier alternative than buses or cabs. Thanks for stopping by! I’m a big fan of trains too. Such a charming and comfy way of traveling. I traveled from Saint Petersburg Russia to Helsinki and back on a 2 day trip this past February – Easy/ carefree way to get there, no issues – I agree, the train in Europe truly is a great option! Thanks for posting all your information – very helpful! Glad you liked the article. Enjoy your travels! Thanks for your guidance ? 1st class will definitely offer you and your baby extra comfort. Is the Russian portion of the trip from Saint Petersburg to Helsinki included? If not how does one handle that? No, the Eurail pass is not valid in Russia. You will need to buy a regular ticket for that journey. Or check if you can go to the border (I think the city is Vainikkala) with your Eurail pass and buy a ticket to St Pete from there, might be cheaper. wanted to check, does euroRail pass covers the city train pass? if i would stay in stockholm for 2 days, the pass can be used? No, Eurail pass does not include local transport within the city. Wow ! Great Info. I am planning about 2-3 weeks in Scandinavia and would love to do the train to see the beautiful scenery. One question I have is: When you book an overnighter does the sleeper car come with the original price ? or do you pay more for a sleeper?? You can book a seat or a cabin, then different prices. We’re going from Copenhagen to Nybro and Kalmar in southeastern Sweden, then to Stockholm over a 1 and 1/2 week period. I had some trouble with the Eurail website, trying to see if there are trains available to get us to Kalmar, etc. Yet when I went on Rome2Rio site, it shows trains running from CPH central train station to Kalmar. Does the Scandinavian Pass cover all train routes, like the one I mentioned? I’ve checked the Eurail App and it shows the routes you’ve mentioned. Just to be sure I would suggest contacting Eurail Customer Service. Another question: Can we take our regular airline-type baggage with us on the train? Are there folks working by the train that can help us? We’re in our 70’s. Yes but some trains have a limited storage area. You won’t find staff in every wagon but I’m sure that other passengers can help you. Super useful guide to start my first time 12 days Scandinavia trip!! thank you for those good information. Wishing you an awesome trip Pratt! Scandinavia is stunning!